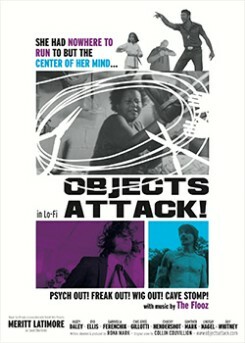 Objects Attack is the story of Lovey Chambers, a passionate but incompetent woman who, after undergoing hypnosis, finds herself in the midst of a resistential crisis. Not only are the objects confounding her, but her boyfriend has vanished and been replaced by an exact duplicate (who doesn't seem to recognize her.) Desperate to find love and restore order to her chaotic life, Lovey must uncover the source of the objects' anger. An affectionate pastiche of B-movies, sixties psychedelia and lo-fi sci-fi, channelling Ed Wood via Blaxploitation all wrapped up in a B&W Super 8 aesthetic. A surefire Midnight Madness festival cult hit.